** Compatible with iOS versions 6.0/6.1/7.0/7.1, Android smartphone versions 2.3.3/4.0/4.1/4.2/4.3/4.4 and Android tablet versions 4.0/4.1/4.2/4.3/4.4. Data charges may apply. Larger than the sensors widely used for compact cameras, the PowerShot G7 X camera's new 1.0-inch sensor is able to collect more light in a shorter time period without the overflow that causes blown-out highlights. This means better detail and more subtle image quality, with rich gradation even at high ISO speeds all the way to 12800. Improved light sensitivity allows for higher resolution with less noise when shooting in dark conditions, and Dynamic IS now detects and compensates for tilt and parallel movement (shift blur) to create video that's exceptionally free of distortion. The DIGIC 6 Image Processor also enhances the performance capabilities of the PowerShot G7 X, powering full resolution high-speed continuous still shooting (even in P, Av, Tv and M modes) and the advanced star shooting modes. The processor allows for MP4 video recording for better compatibility with mobile devices and tablets. The new processor also supports an MF Peaking function, giving you a pro-level focusing tool. Beautiful low-light shots are possible with minimal noise and truly impressive detail in both highlight and shadow areas. The system is the result of two technologies in the PowerShot G7 X: the large format 1.0-inch High-Sensitivity CMOS sensor, which captures more light; and the DIGIC 6 Image Processor, which actively reduces noise at high ISO speeds up to 12800 and processes images at high speed, even at full resolution. With a very bright aperture value of f/1.8 at the wide angle and f/2.8 when fully zoomed to a factor of 4.2x (24mm-100mm), this lens not only puts more in your frame, but is equipped to capture an incredible variety of situations with artistry and precision. Equipped with a 9-blade Iris diaphragm, the lens lets you achieve a beautiful background defocus with shapes that are nearly round. Capture macro shots from as close as 2.0 in. (telephoto at 1.3 ft.). 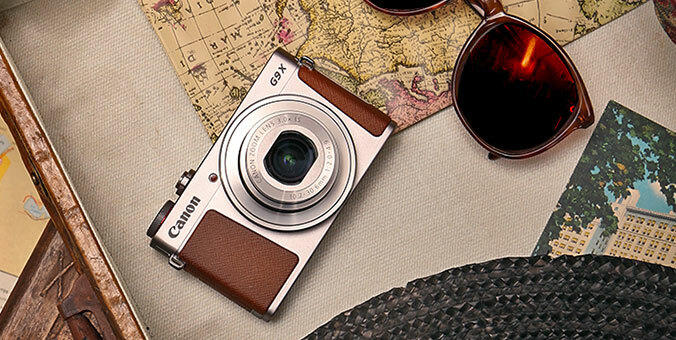 The PowerShot G7 X camera's LCD screen can tilt up 180°, so taking that perfect selfie is a snap! Capacitive touch-panel operation feels familiar right away: simply touch to access quick control settings, focus and shutter release right on screen. Powered by the DIGIC 6 Image Processor, the PowerShot G7 X camera gives you a seamless, high-speed continuous shooting (up to 6.5 fps) experience that's fully available in P, Tv, Av, M and Auto modes. Shooting and processing are now performed in tandem, reducing buffering time to deliver high shooting speeds. With 31 focus points arranged in an expanded, wide pattern across the image plane, the PowerShot G7 X focuses with admirable speed and precision. Smaller focus frame sizes also make it possible to obtain accurate focus on small subjects. The PowerShot G7 X camera supports NFC (Near Field Communication) technology. Simply touch the NFC icon on your camera to your compatible Android™* device, and the CameraWindow app will launch automatically for remote shooting and quick, easy sharing of your images. Built-in NFC technology also makes it simpler to install the app. If the app hasn't been installed yet, once you touch the devices together for the first time, the download screen will display automatically. *30-1.3 sec is available only at ISO 125-3200, 250-40 sec. is available only at ISO 125. *Optimal ISO speed is automatically set depending on the shooting mode. *1 Using an 8 GB, UHS-I compatible memory card that meets Canon's testing standards. The number of shots changes depending on subjects, brands of memory cards, etc. Shooting in RAW (including RAW+JPEG) is excluded. *4 Actual frame rate is 59.94 fps. 8GB 26 min. 22 sec. 10 hrs. 42 min. 58 sec. 20 hrs. 34 min. 24 sec. 38 hrs. 15 min. 35 sec. 26 hrs. 45 min. 37 sec. 48 hrs. 27 min. 58 sec. 82 hrs. 18 min. 04 sec. 145 hrs. 30 min. 01 sec. 189 hrs. 46 min. 59 sec. 32GB 1 hr. 46 min. 33 sec. 43 hrs. 17 min. 23 sec. 83 hrs. 06 min. 30 sec. 154 hrs. 33 min. 09 sec. 108 hrs. 05 min. 38 sec. 195 hrs. 46 min. 14 sec. 332 hrs. 26 min. 26 sec. 587 hrs. 28 min. 48 sec. 766 hrs. 11 min. 28 sec. 8GB 30 min. 03 sec. 43 min. 29 sec. 2 hrs. 03 min. 55 sec. 5 hrs. 14 min. 34 sec. 32GB 2 hrs. 01 min. 27 sec. 2 hrs. 55 min. 43 sec. 8 hrs. 20 min. 32 sec. 21 hrs. 10 min. 38 sec. *5 Only with shooting interval of 30 sec. The image data in the memory card stored with the Design rule for Camera File systems formate can be erased (however, protected images cannot be erased).